Ever wished you could clone yourself to keep up with all your commitments? We get that sentiment at SignUpGenius, and we’re here to help you — minus the messy gene splicing. Plan your school, church, business, sports and group events more easily by assigning multiple administrators to your premium account. Our Multiple Admin tool allows you to organize your PTA fundraisers and events in a snap by giving different people in your committee custom levels of permission. For instance, you can allow certain people to create and manage sign ups on your account, while others can view reports or simply monitor if slots are being filled for your big BINGO night. To get started, log in, and click on the “Tools” button from your main account page (on the left side of the page). From there, select the “Manage Administrators” button. Select the orange “Add Custom Role” button, and you’ll be on your way to adding helpers and defining their roles. From there, you can designate a name for the role and select from a menu of options that will allow you to decide if a person can create sign ups, manage sign ups, manage GeniusDrive files, iCal Feeds or Custom Themes. You can even drill down further by assigning permissions to specific sign ups and determining if a subadmin can edit a sign up, send messages, view data and more. Booster Club: Assign coaches or team parents different permissions from one premium account to create and manage sign ups for the sports season. Class Parent: Let room representatives and teachers manage sign ups in the same account, so they know everything that’s going on in the classroom. Company Account: Give different managers and departments the ability to manage sign ups from one business account. Church Ministries: Equip different ministries (church choir, Sunday School, etc.) with different admins who manage their own sign ups. Genius! Who says there can’t be more than one of you? Eliminate ads from your sign ups. Learn how to hide names on your sign ups for privacy. A silver subscription allows you to add one additional administrator that can help you manage sign ups in your account. This admin is in addition to you, the main administrator. I'm new at this and not clear on the "multiple administrators" limitations. Under the silver pricing tab, multiple administrators shows "1". What does this mean, only one additional administrator? Only 1 administrator? Great question! The only person who can assign admins is the main account holder. Sub-admins do not have access to the "Manage Admins" area of the account. Can added admins for an account be given permission to add other admins to the account? 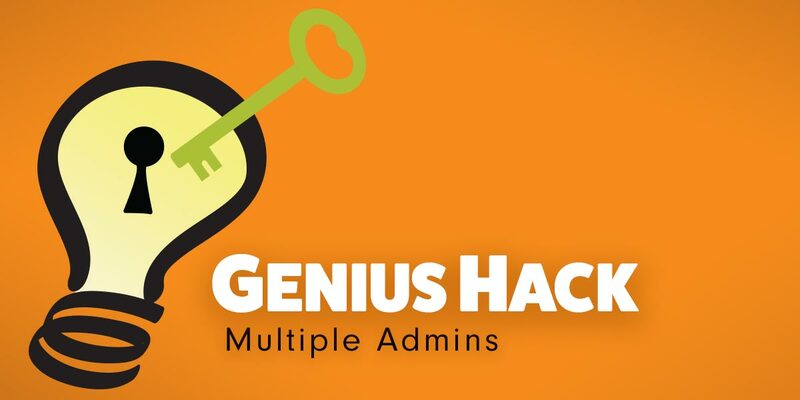 How many admins can you have on one pro account? To clarify, we always give users the option to create an account if they wish to do so, but it is not required. If you have a user who has used our site in the past and created an account at some point, they will have to sign in to use the email address associated with that account. Our system will not let someone enter their name and email address without logging in if they have created an account in the past with that email address. If you have users that are frustrated with that, please direct them to our help page where they can email our support team. We can then delete their account from the site, or assist them in retrieving their password so they can log in. Your sign in policy is a pain! Plan your school, church, business, sports and group events more easily by assigning multiple administrators to your SignUpGenius Pro account. To get started, log in, and click on the “Pro Tools” button from your main account page (on the left side of the page). From there, select the “Manage Admins” button. Booster Club: Assign coaches or team parents different permissions from one Pro account to create and manage sign ups for the sports season.